Taiwan Manufacturer 9oz Sapien Arms Ultra Elite Green Gas, GG10 by TSD. .
Gas powered airsoft guns require "green gas" to operate. Silicone mixed for gas gun series. To fill the magazine or reservoir with the gas you hold the can upside down vertically and match the nozzle with the port (just like an old butane lighter). Fill in "spurts". Since it is a cold gas allow it to expand between sprays. This saves gas and won't freeze your magazine. The gun will spit when it is full. If the magazines feels too cold -- it is, let it warm up! If you are skirmishing we suggest a back-up mag. Info:Gas is the source of power behind gas blowback weapons. Although there are many gasses of different compositions, the two most popular gasses are Japanese HFC134a and Taiwanese green gas. 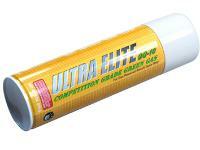 Japanese gas or HFC134a is the lowest powered gas and is meant for use in Japanese GBBs. 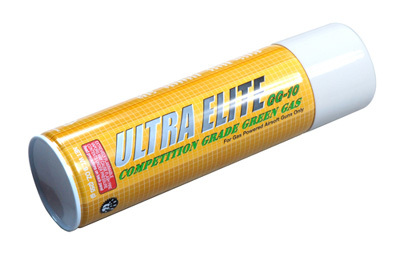 Taiwanese gas, also known as green gas is for use in Taiwanese GBBs. It has more power than HFC134a, which creates stronger recoil and greater muzzle velocity. Customers can use Green gas in their Japanese GBBs. However, this will greatly decrease the life of the gun. So, there is a trade off of power for durability of the GBB. Things I liked: It's easy to use. Things I would have changed: There really isn't anything to change about a bottle of gas. What others should know: It has an unmistakeable odor. You know when the gas is filling the mag.